The two sides pulled apart, but the pause was more like that of the tide pulling back from the beach to form a huge wave. It only promised an almost immediate onset of new violence. 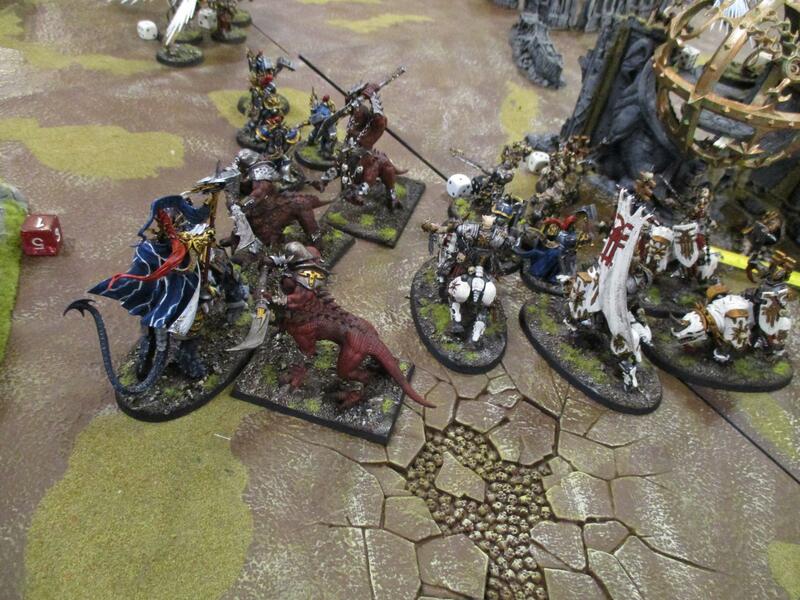 Sarius screamed his question to the warriors regrouping around him. Their lord Ason-Har was not among them. Ortosersex, chieftain to the Strangled Maiden clan, was the first to answer. "Last I saw him he was near the fallen tower fighting against the Sigmarites there." "He was there," growled Ramsysis of the Cult of the Iron Boot, "but later I saw him closer to the realm gate trying to cut his way through." The group parted as the mechanical motions of Skilurus and his herd of Skullcrushers. "I believe I saw him fall near the Occulus. He was repulsed from the gate and moved that way but I lost sight of him as we pulled back." Sarius turned on him and pointed his axe, "Did you see him go down? Are you sure?" Skilurus moved his juggernaut forward pushing past the outstretched axe until the steam billowing nostrils of the great beast were at Sarius' chest. "I don't know," he intoned his voice flat but his cadence full of malice, "I was busy." "If he is still alive then we find him, if he is dead, I want that axe," said Sarius. "Otosersex, take your tribe straight at the Eternals near the tower. Skilurus charge around the occulum and Ramysis you take your warriors through the cemetery and then head straight for the realmgate." Across the body-strewn plain the Stormcast waited for them. When the Bloodbound turned, surging forward the Sigmarites sprang to life themsevles. The wave was about to crash. Arrows flew from the ranks of the Judicators as the Bloodbound surged forward. Celestial hammers were hurled as fast as the Prosecutors could move their arms. Men were struck from their feet with the impact of the missiles but still they came on. On the left flank of the Sigmarite army the Eternals moved to meet the enemy while in the center they formed a solid wall of steel ready break the onrushing tide. 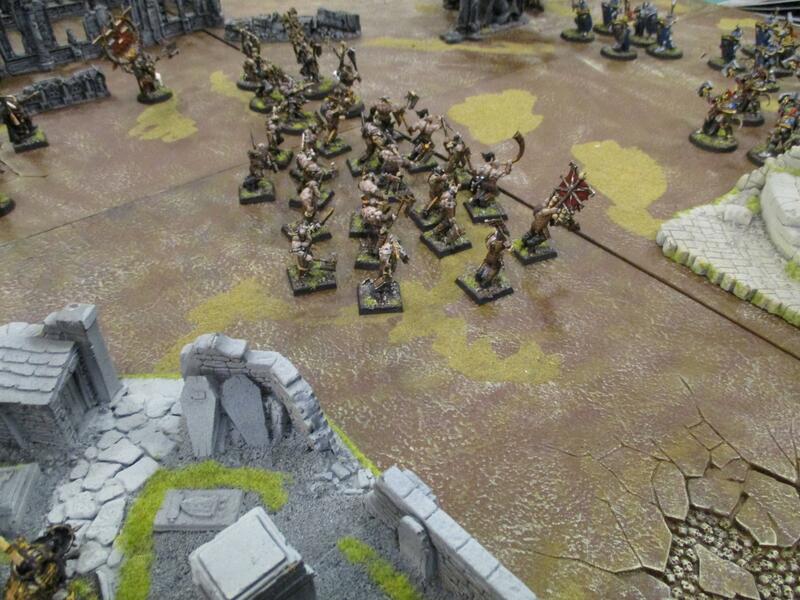 The first clash was on the far right of the Bloodbound line, the Liberators rushed at the Cult of the the Strangled Maiden warriors as they moved through the cemetery. The clash of steel echoed off the shattered tombstones and stone walls as the two warrior cadres slammed their weapons into each other with little effect. Soon Skilurus struck the archers who had been so injurious to his warriors as they moved along the open plain. 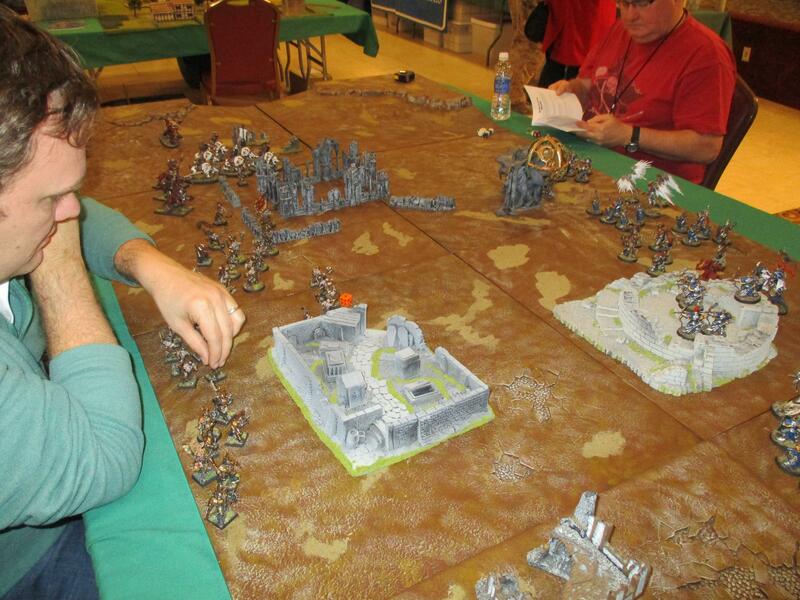 The stormcast stood to and withstood the initial impact, fighting bravely on foot against the monstrous daemon machines. 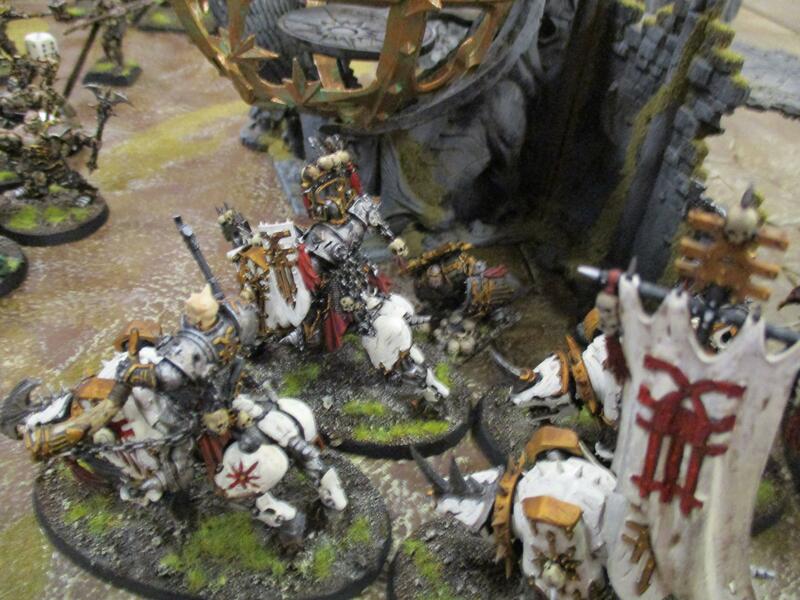 Howling, the Skullreapers smashed into the Sigmarite center-right and in no time at all their blood thirsty weapons had made short work of the unit opposed to them. Not to be outdone Otoserex led his men straight into the teeth of the very heart of the Eternal forces. 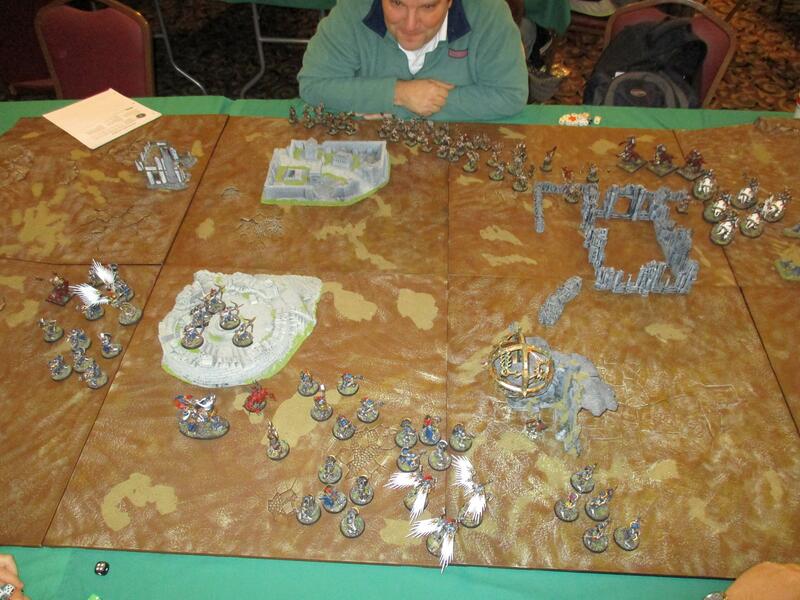 His men went toe-to-toe with the Retributors and the Liberators. Among the warriors a sound could be felt more than heard. It was not above the sound of clashing metal, screaming pain and war cries and it was more below it. A thrum more than anything else. But as the Retributors moved among the Bloodreaver tribe, their hammers smashing the bodies of men into something more closely resembling a puddle the thrum grew in intensity. It was coming from Kolomie, the Slaughterpriest and as more warriors fell on each side it became stronger. Sarius leapt the battlements of the occulum and smashed into the Prosecutors with his axe. He was close to wear the Skullcrusher had said Ason-Har had fallen. When he slew these few flitting birds he would be there. 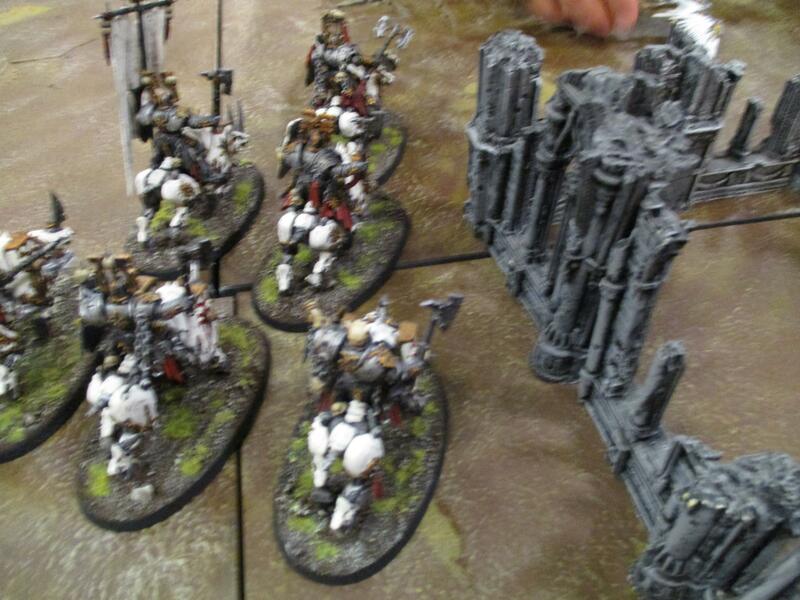 On their right the bloodbound were stuck. 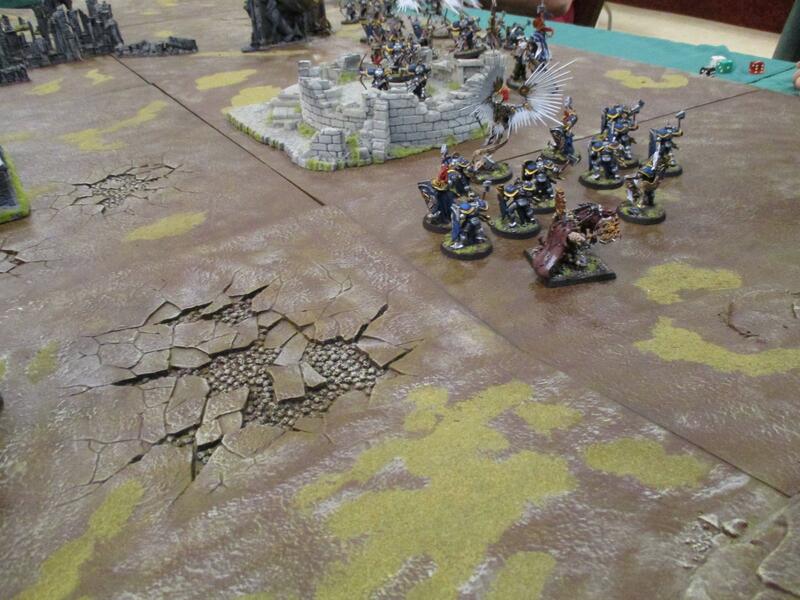 Warriors stumbled over tombstones as they attempted to strike each other down. A second group of Liberators joined in the fighting, the light shinning from Lord Castellant Clovis Sangrael illuminating their armour and making it hard for the Chaos warriors to look upon them. Steadily the Cult of the Strangled Maiden were forced back. There would be no move on the realmgate from this direction. The thrum filled the plain now and rose to a crescendo as the Slaughter priest raised his axe high and clove through the air. A rent in the fabric of reality appeared before him, the gore, thick in the air flowed around in, making a whirlpool of red. It bucked and swayed and then in a crimson multi-directional shower disappeared. The slaugherpriest looked dismayed for a moment, noticing the broken arrow shafts protruding from his arm for the first time. 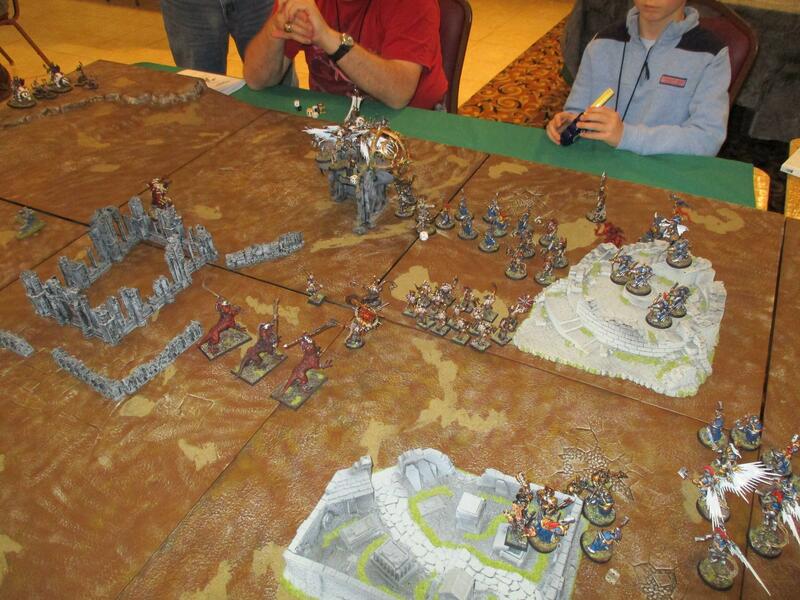 The skullcrushers smashed their way through the last of the Judicators and turned the corner of occulum. There was Ason-Har, it was difficult to tell if he still lived or not. Skilurus reached down and pulled the Chaos lord out of the pile of bodies that half-buried him and screamed, "He is here." His words almost made it seem as if someone had spilled a red inkpot on the battlefield. Such was the intensity of the Bloodbound to reach the fallen leader and the Sigmarites to oppose them. The skullcrushers surged forward into the Retributors while Sarius continued to carve at the Prosecutors, two of them dead now while Sarius himself suffered from many wounds and barely stayed on his feet. Only the slaughterpriest moved towards the fallen lord, his chanting starting anew. 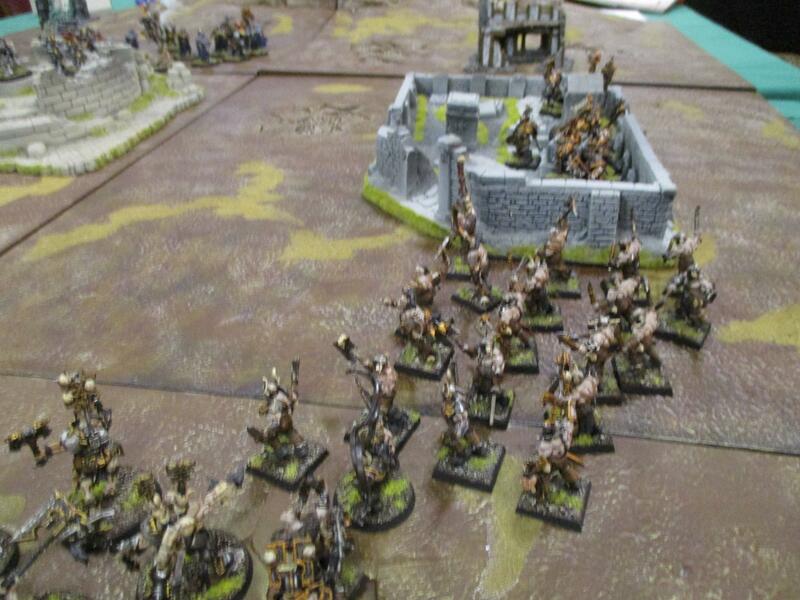 Sredni Vashtar, Lord Cellestant of the Scimitars of Sigmar joined in the fray with the Skullcrushers after dispatching the last of the Dragon Ogres that had assaulted him. 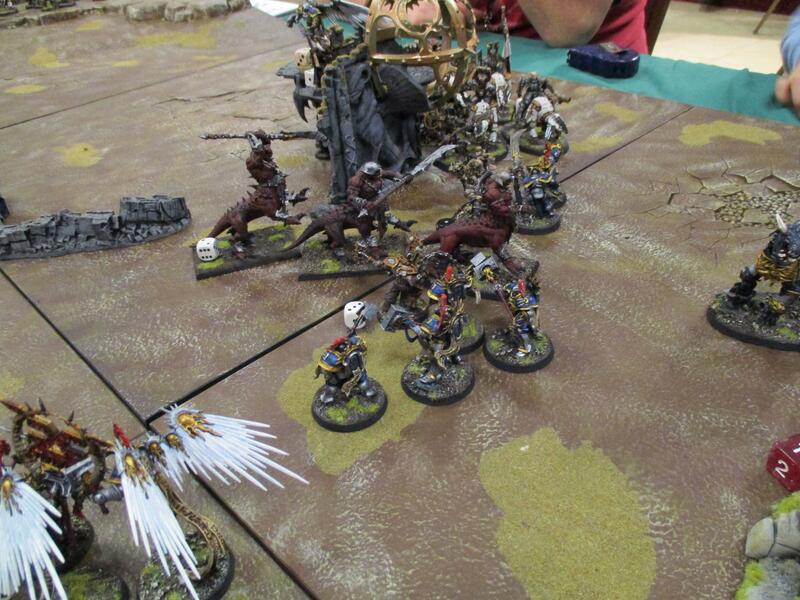 Between Vashtar and the Retributors the Skilurus and his skullcrushers were battered to the ground. The thrum rose again to a zenith and again the blood from the battlefield swirled. This time though skittering creatures with massive blades came forth from the darkness beyond. Their forms hunched and almost shimmering with animosity they formed a protective screen around the Chaos Lord while the slaughterpriest lifted his body from the ground and the Chaos forces moved away, the blood letters preventing the Sigmarites from following too closely. Once again came a calm in the violence, but it too would not last long. Nice looking battle. Thanks for the Bat Rep.
Amazing battle report, fantastic narrative as always! It was a fun game. We had 3 players. We did it at Williamsburg Muster today. The game was very close and if it had ended on the 5th turn I'm not sure that the Bloodbound would have won. 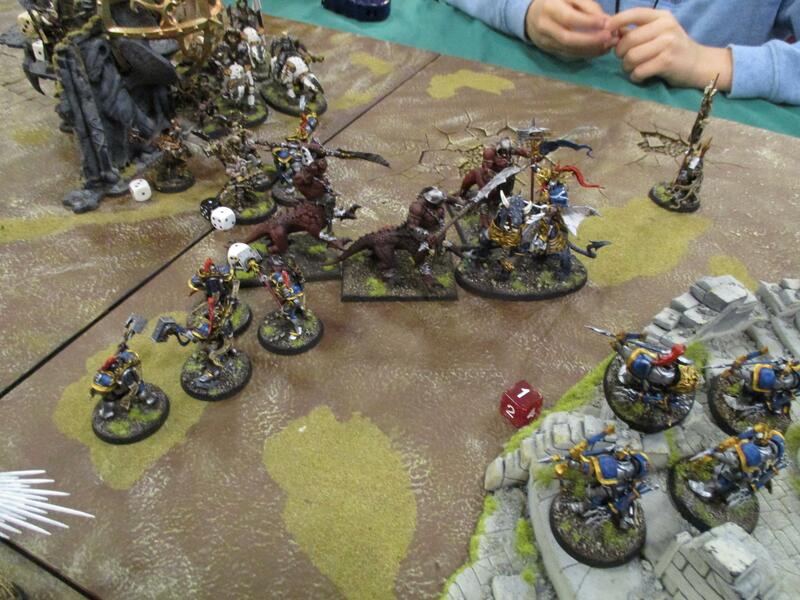 As it was the daemons they were able to summon were what saved the game for them. Another tight, close game with lots of slaughter. As usual for Age of Sigmar.